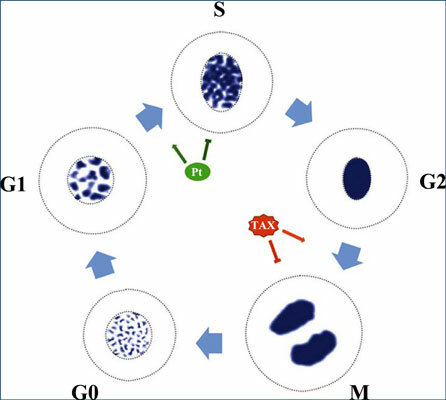 Methods: After treatment, the MTT assay was used to assess cell viability; cell cycle distribution was evaluated flow-cytometrically. Western blot was used to quantitate cyclin D1, E1, B1, and Cdk2/4 protein levels. Results: Lobaplatin and paclitaxel inhibited SGC-7901 cell growth in a concentration and timedependent manner, with IC25 values at 48h of 1.97±0.17µg/ml and 1.98±0.19 ng/ml, respectively. Interestingly, both drugs synergistically inhibited SGC-7901 cells (combination index [CI]<0.95). Lobaplatin did not affect cyclin D1 and CDK4 protein expression, while cyclin E1 and CDK2 levels were significantly increased, with cyclin B1 amounts markedly decreased (p<0.05). More S phase cells were observed after lobaplatin treatment compared with controls (60.03±1.25 vs. 18.69±0.96%; p<0.05). After treatment with paclitaxel, cyclin D1 and CDK4 protein levels were similar to control values; meanwhile, cylinE1 and CDK2 protein amounts were reduced, with increased cyclin B1 levels, compared with control values (p<0.05). More G2/M cells were obtained after treatment with paclitaxel compared with control values (74.54±0.92 vs. 18.62±0.44% (p<0.05). Lobaplatin and paclitaxel combination did not affect cyclin D1 and CDK4 protein levels (p>0.05); meanwhile, cyclin E1 and CDK2 levels were increased, with reduced cyclin B1 amounts, compared with control values (p<0.05). Notably, more S (43.23±0.81 vs. 22.32±0.86%) and G2/M (31.22±0.96 vs. 25.81±2.08%) phase cells were obtained after combined treatment compared with control values. Conclusion: Lobaplatin and paclitaxel synergistically inhibit SGC-7901 cells. Lobaplatin, Paclitaxel, gastric cancer, cell cycle protein, cell cycle arrest, anticancer mechanism.